For several decades now, the lubricant and fuel industries have been leading partners of motor racing sports in general and of Formula 1 in particular. The motivation for this involvement is of course the extraordinary promotional aspects of this racing series, which, every Grand Prix weekend, benefits from worldwide TV cover reaching over 300 million TV viewers. Clearly, the involvement of the major oil companies is motivated by communication strategies seeking impact and maximum visibility. In this context, the example of the Elf , Shell, Mobil, Petrobras, BP Castrol and other brands is particularly meaningful. Elf, for example, was created in 1967 and immediately got involved in the Formula 1 world championship along with the Matra Ford team and its star driver Jackie Stewart - a combination that won a world title in 1969. This success was the first in a long series. Elf have today an impressive record of 15 world titles, 134 Grand Prix victories and 155 pole positions out of the 465 Grand Prix entered. However, Elf's and other suppliers involvement in the Formula 1 world championship is not merely a question of communications and marketing. The day-to-day running of the championship is mostly the business of the engineers and technicians in the suppliers Formula 1 team, whose responsibility is to devise, produce and deliver the products that can appreciably improve racing car performance. Anyway, the contribution of lubricants to the competitivity of a Formula 1 car remains largely unnoticed, with other components such as the engine, the chassis, the aerodynamics or even the tires being the subject of most of the comments. Formula 1 lubricants are not governed by any particular regulations, unlike the fuel for which the FIA has handed down highly restrictive rules (with the RON restricted to 102 compared with 128 for fuels sold to the public). That's mean, the lubricants can be formulated with the single objective of improving the car's performance, without worrying about any limitations. This opens the way for the lubricant to make a maximum contribution to the overall competitiveness of Formula 1.
lasted for 1,000 miles. On the plus side, some of the impurities acted as anti-wear and detergent chemicals. They didn't work very well, but it was better than nothing. The engine wore out in around 20,000 miles, but even ordinary people, not just amateur rally drivers, were happy to put up with this. So, a good oil must be quite low in viscosity even in the cold, so that it gets around the engine in a fraction of a second on start-up. On the other hand, it must protect engine components at temperatures up to 300° C without evaporating or carbonising, and maintain oil pressure. The primary function of the lubricant in Formula 1 and any other internal combustio engine is ensuring safety and reliability in an extreme situation. 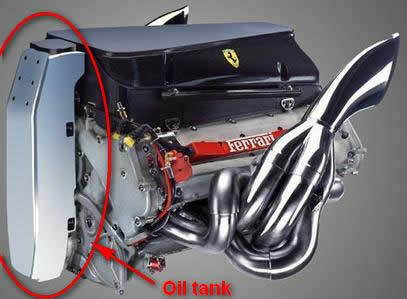 The oil is stored in a tank mounted in the front of the engine. This then gets pumped to an oil radiator in the sidepod. Now cooled, it is then directed to the major moving parts inside the engine; the crankshaft, the cams and some oil is evenly sprayed under the pistons to keep them cool. After that, used oil drains into the sump at the bottom of the engine, where is collected and by pumps passed back to the oil tank. As in any internal combustion engine, the main function of the lubricant is to form a barrier between the moving parts to prevent any metal-to-metal contact, so, the oil keeps moving parts apart. Any such direct contact between moving parts can lead, at the worst, to a breakdown due to seizing or, at best, accelerated wear of the engine that will prevent the car from finishing the race. In a Formula 1 engine, which develops a power output some 6 to 10 times higher than the motor in an ordinary car, the mechanical stresses acting on the different components increase exponentially. It is possible to get a good idea of the extent of these stresses by considering the movement of the piston in the cylinder. In a 2.4-litre, 8-cylinder Formula 1 engine, developing a maximum power output of nearly 800 HP at 18,000 rpm, the piston speed increases from 0 (upper and lower dead point) to over 37 m/s (133.2 Km/h), and then back to 0 - this process being repeated 600 times a second through a distance of about 4 cm! Revving at such massive speeds equates to an accelerative force on the pistons of nearly 9000 times gravity (9000 g). These incredible accelerations and decelerations experienced by the piston over so short distance gives a more precise idea of the extent of the mechanical stresses acting on the engine components and the lubricant. In concrete terms, these constraints stresses are manifest as a huge frictional forces on the piston, between the piston rings and the cylinder wall, the connecting rods and the bearing shells, and the crankshaft and its journals. In coping with these enormous mechanical loads exerted between components, the role of the lubricant is to «persist» in order to prevent any metal-to-metal contact, and to retain an appropriate degree of fluidity such that the induced friction in the oil film is as small as possible. The enormous pressures between the mechanical components also result in the production of heat of almost 2000°C produced by the combustion of the fuel. The higher the contact pressures and the relative speeds of the moving parts, the greater is heat production. The lubricant then has to act as a heat regulator, in order to keep the engine at its optimal running temperature and to prevent any breakdowns caused by overheating. The increase in temperature is particularly noticeable at the piston rings. The explosion that takes place in the combustion chamber develops high pressure on the piston head, which is exerted laterally on the piston rings, pressing them against the cylinder walls, all this at relative speeds that vary from 0 to 130 km/h some 600 times a second (300 upward and downward movements of the piston at 18,000 rpm). Some of this heat is removed from the cylinder by the oil film, which enables the piston to maintain its equilibrium temperature (not much above 400°C on the piston head). The friction and mechanical pressures experienced by the lubricant are a severe test. In these extreme conditions, it actually faces a kind of tearing effect, a form of torture that continuously threatens to break down the lubricant's molecules itself. The oil can then no longer fulfil its function of keeping the engine reliable in the manner required. The response of the engineers in the oil supplier lab's is to select those base oils and additives that provide robust and stable molecular structures. The resulting stability is virtually indestructible, making it possible to prevent any breakdown of the oil film and enabling the lubricant to retain its performance level throughout the race. Oxidation of the oil is one direct result of the high temperatures to which it is exposed in an atmosphere that favours oxidation. This phenomenon is visible to the naked eye since it leads to the formation of deposits and black sludge (the lubricant is said to be «caramelised»). The oil then becomes thicker and loses its original fluidity. This thickening of the oil can cause a fall in engine performance and is a direct threat to its efficiency and reliability. Once again, the answer to the problem is a chemical one. It involves selecting ingredients that offer enhanced resistance to oxidation, and including special chemical additives in the lubricant formula that combat the process. In a Formula 1 engine running at full power, friction induced by the movement of moving parts absorbs up to 40% of the mechanical energy produced by the combustion of the fuel. The phenomena involved are for example the rubbing of the pistons and piston rings on the cylinder wall, the connecting rods on the bearing shells, the crankshaft on its journals, and the camshaft (opening and closing the valves). In addition to friction, there are other processes that use up energy and therefore power, such as the driving of the oil pump and the timing system. All this represents a loss of power that the engineers attempt to reduce. In this field therefore, the characteristics of the lubricant play an essential role. In considering how the lubricant contributes to increasing power, the fundamental aspect is its viscosity. While the presence of the oil film between all the moving parts is a guarantee against wear, its thickness is a factor in increased friction and hence greater resistance to movement. A thinner lubricant will permit more fluid operation of the engine, with only a minimum proportion of the power produced being used to overcome friction. The oil film must therefore be as thin as possible (about 2-3 µm) although without compromising its role in protecting the engine: it must of course continue to prevent any wear of engine parts. Accordingly, through in depth research on viscosity and friction at all parts of the engine and gearbox, the lubricants developed by F1 suppliers make it possible to gain several per cent in power. In a hyper-competitive situation where any marginal gain can produce a decisive strategic advantage, the importance of this contribution is decisive. The impact of the lubricant on overall competitiveness in Formula 1 can also be seen in the fact that they normally develop specially formulated lubricants, for the qualifying sessions. The lubricant's role as a thermal regulator is indirectly at the origin of a few additional engine HP. We have seen that the lubricant is able to carry away some of the heat produced in the engine in order to maintain the best operating temperature. This heat carried away by the lubricant is then dissipated through the radiators. By withstanding increasingly high temperatures, the lubricant enables to reduce the size and weight of the radiators. In this way the engine oil will make it possible to increase the performance of a Formula 1 car by the weight saving, but also through the aerodynamic improvements that result from a smaller radiator and the size of the air intakes can be made smaller which, once again, will lead to an aerodynamic gain. The oil that you put in your race car will invariably come from the same place, this will be the oil companies supply of best quality fully synthetic base stock which is chemically engineered to give optimum lubrication properties. For racing and high performance oils only fully synthetic base stocks will be used, as only they can guarantee the required consistency of performance, temperature resistance and an ability to be engineered at a molecular level to very specific needs. So the base stock provides the best foundation possible for lubrication, to this are added the other compounds that will improve the oil to high performance applications. A number of additives are used. All jet engines are lubricated with synthetic esters, and have been for 50 years, but these expensive fluids only started to appear in petrol engine oils about 20 years ago. Thanks to their aviation origins, the types suitable for lubricants (esters also appear in perfumes but they are different!) work well from –50º C to 200º C, and they have a useful extra trick. Due to their structure, ester molecules are 'polar'. They stick to metal surfaces using electrostatic forces. This means that a protective layer is there at all times, even during that crucial start-up period. This helps to protect cams, gears, piston rings and valve train components, where lubrication is 'boundary' rather than 'hydrodynamic', i.e. a very thin non pressure-fed film has to hold the surfaces apart. Even crank bearings benefit at starts, stops, or when extreme shock loads upset the hydrodynamic film, as happend in rallying and off-road. protected by anti-oxidants. The difference is, they are inert, and not polar. In fact, on their own they are not good 'boundary' lubricants, with less load carrying ability than mineral oil. They depend entirely on the correct chemical enhancements. In fact PAOs work best in combination with esters. The esters assist load carrying, reduce friction, and cut down seal drag and wear, whilst the PAO's act as solvents for the multigrade polymers and a large assortment of special compounds that act as dispersants, detergents, anti-wear and anti-oxidant agents, and foam suppressants. Both are very good at resisting high-temperature evaporation, and the esters in particular will never carbonise in turbo bearings even when provoked by anti-lag systems. High performance synthetic oil base is built "molecule by molecule" to specific designe. Mineral oil will never provide same customability as specificaly designed syntetic oil. It is impossible to make a good 5W/40, or even 10W/40, using only mineral oil. The base mineral oil is so thin, it just evaporates away at the high temperatures found in a powerful engine that is being used seriously. Although there are chemical compounds in there to prevent oil breakdown by oxidation, they cannot adequately protect vulnerable mineral oil at the 130º C plus temperatures found in hard worked turbocharged or re-mapped engines. Synthetics are the answer. They are built up from simple chemical units, brick by brick so to speak, to make an designed oil with properties to suit specific engine and specific use. True synthetics are expensive (about 6 times more than top quality mineral types). The lubricant is for the engine what blood is to the human body. Its after race analysis provides information as to the overall operation of the organism. In this way, the spectrometric analyses of the oil using processes developed by suppliers provide the engineers in the Formula 1 teams with significant data on the operation of the engine. As the mileage builds up, the lubricant becomes charged with substances produced by the operation of the engine. While some are the result of normal wear of component parts, others are the sign of abnormal wear that threaten the reliability of the system. Solutions to these problems can then be devised either by changing the lubricant formulation, or by changing the engine design or the materials used. In any event, analyzing the data provided by the oil can avoid many kinds of breakdown. F1 teams acknowledges that a number of engine failures were avoided in this way during the season. The second major function of the lubricant is contributing to better engine performance. Here is the list of all lubricant manufacturer competing in Formula 1 in last 60+ years, and active years.